We’d like to take time in this week’s CWL to introduce a new member of our staff Chris Maisano. Chris interned for us last summer and liked the office, staff and working with coins so well that he accepted a full time position with us and started January 2nd. His numismatic interests are extensive, and he plans on personally completing a date and type set of Early Dollars from 1795 through 1803. Currently Chris is working on a Carson City Morgan Dollar set, but is fascinated with all U.S. coinage. Besides working on cataloging new coins here in the office and attending the major shows, Chris will be using is numismatic knowledge and love of coins to help us draft our weekly Coins We Love emails. We are thankful to have such a bright, young numismatist on staff and hope you enjoy his musings and energetic appreciation for coins! Why we love it: This beautiful ultra-gem Barber Quarter displays fantastic luster and pristine nearly completely white surfaces. The surfaces are mostly bright white with a pretty, subtle glow of golden toning which combined with plenty of gorgeous luster give this coin premium eye appeal. Although this date is more common, in high grades such as this, it becomes scarce as there are only two others at PCGS in the same grade and just one finer across all grading services. Value: The PCGS Price Guide has this coin valued at $10,500. It is available in this week’s auction with the reserve set at a very low, fair amount of just $8,000. $2,500 less than the PCGS Price Guide! Why we love it: This blazing red gem has gorgeous proof cameo surfaces that are most evident on its obverse. The very impressive, premium eye appeal of this low mintage proof comes from the cameo surfaces that display a unique, very attractive contrast between their very frosty devices and bright red fields. This example comes from a very low, original mintage of only 725 coins, in which it is tied for the finest known graded by PCGS with the cameo designation. Value: The PCGS Price Guide has this coin valued at $11,000. This gem proof 2-Cent Piece has gorgeous red coloring and lovely cameo surfaces yet is available for only $7,100 via Make Offer! Nearly $4,000 below the PCGS Price Guide Value! Why we love it: A very attractive, affordable Peace Dollar with the popular variety of the VAM-1F, Chin Bar. This example has a gorgeous, blast white obverse with plenty of luster that is complemented nicely by a reverse completely covered with some of the most deep, rich toning you will see on a Peace Dollar. That stark contrast in obverse and reverse toning gives this coin great eye appeal. 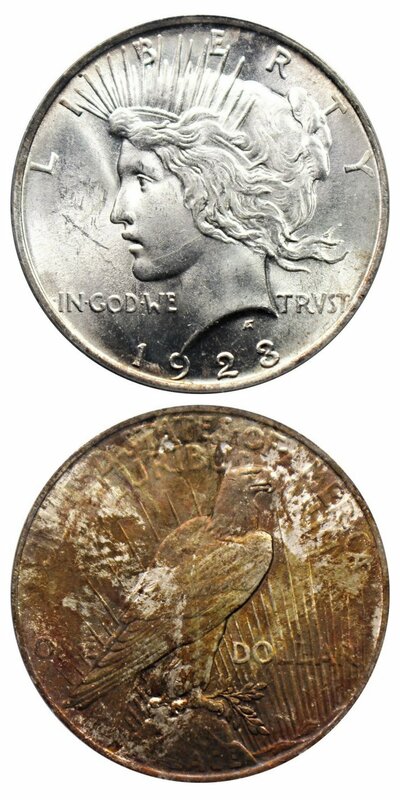 Value: This Peace Dollar variety is very popular, and our example has especially nice eye appeal with its pretty, unique toning on the reverse. It is available for purchase very reasonably for just $225 via Make Offer! Why we love it: This scarce Classic Head Quarter Eagle type coin has extremely attractive surfaces with its pretty yellow-gold coloring and fantastic luster. This stunning luster in these bright yellow-gold fields complement the coin’s frosty, nearly blemish-free devices beautifully. This example is especially desirable because it’s a first year of issue and is CAC approved! Value: The PCGS Price Guide has this coin valued at $17,000 in its MS64 grade, but jumps all the way to $60,000 in MS65! With that in mind, this desirable Classic Head Quarter Eagle type coin that is close to gem condition proven by its CAC approval is available for just $15,750 via Make Offer. That is over $1,250 under the PCGS Price Guide for its grade! This is a perfect opportunity to acquire this coin so close to gem grades without paying the additional nearly $45,000! Why we love it: This scarce gem Capped Bust Dime displays gorgeous, nearly prooflike surfaces with no noticeable blemishes. These intriguing, pristine surfaces are complemented beautifully by the lovely rose-gold toning, especially on the devices. 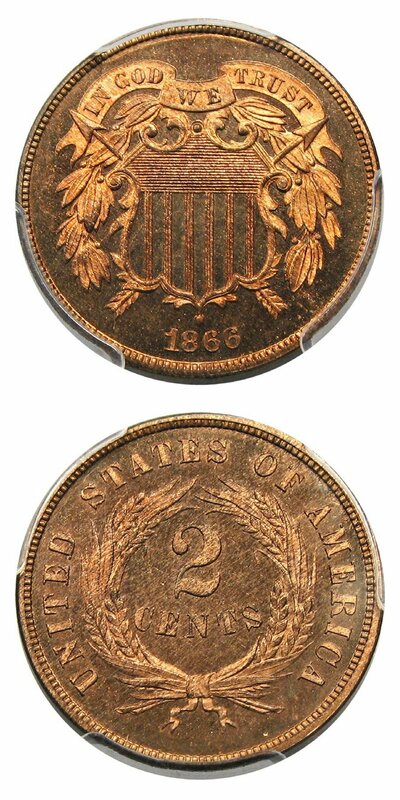 According to PCGS CoinFacts there are only an estimate of 25 examples of this coin in existence, and only seven graded finer by PCGS. Value: The PCGS Price Guide has this piece valued at $10,500, which we feel is a very accurate depiction of this coin’s value. The gem example we have available in this week’s auction, even with its unique surfaces, lovely toning and CAC approval making it very high end for its grade, is reserved very reasonably at $10,750. Why we love it: This very popular, better date Carson City Mint Liberty Head Double Eagle has very pretty, original surfaces with a stunning prooflike look to them. Between the attractive, unique surfaces and very limited traces of wear, this coin has very nice eye appeal. It comes from a low, original mintage of only 30,945 coins struck with just a fraction that survived. Value: The PCGS Price Guide has this coin valued at $11,500 and the CPG Value is at $11,900. This popular Carson City Double Eagle with its uniquely attractive prooflike surfaces is available for only $9,650 via Make Offer! An entire $1,850 below the PCGS Price Guide Value, and $2,250 below the CPG Value! Why we love it: A scarce, ultra-gem Three Cent Piece with nearly perfect, blast white surfaces that are complemented by considerable amounts of gorgeous luster. Not only is this coin beautiful but it’s also scarce as it is quite difficult to come by in high grades. There are only two known examples graded finer and just sixteen others in the same grade. Value: The PCGS Price Guide has this coin valued at $20,000. This lustrous, scarce ultra-gem Three Cent Piece is priced incredibly low as you can purchase it for only $11,500 through Make Offer! That's $8,500 below the PCGS Price Guide Value! 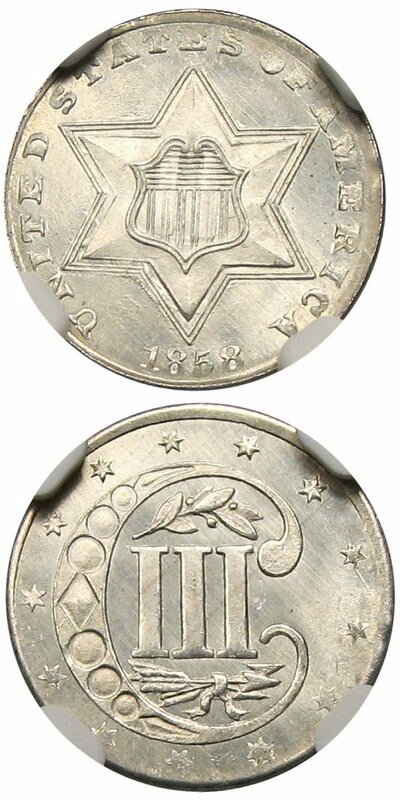 Why we love it: The 1939-D has one of the lowest mintages in the Oregon sets and one of the lowest across all Classic Commemorative issues overall with only 3,004 coins struck. This ultra-gem example has extremely lustrous, mostly white surfaces with a hint of toning. 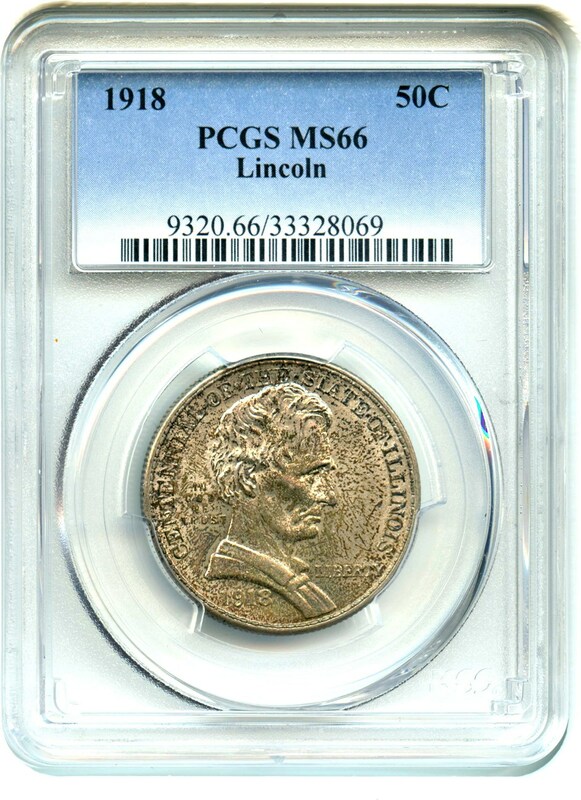 It is one of 28 examples graded MS68 by PCGS with none graded finer. Value: The PCGS Price Guide has this coin valued at $4,500 and the CPG Value is at $4,380. 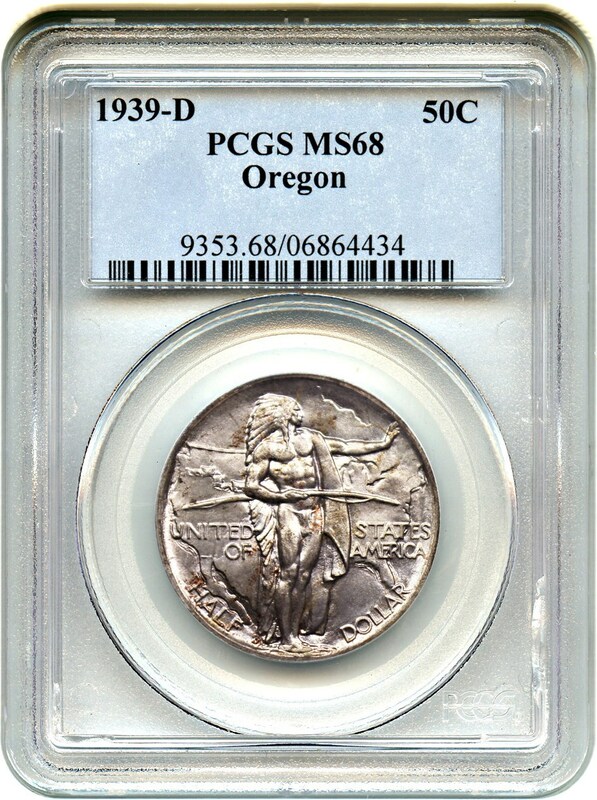 This low mintage Classic Commemorative from the popular Oregon set is available for the very reasonable price of just $4,050 through Make Offer! That's $450 below the PCGS Price Guide Value and $330 below the CPG Value! Why we love it: This underrated, better date Barber Half Dollar is a beautifully toned ultra-gem. This is a gorgeous, high-grade example of a much scarcer date that does not get the attention it deserves. The toning this coin displays is stunning especially on the obverse with a pretty mix of blue and lavender throughout and bright rose highlights in the center. There is only one example graded finer by PCGS. Value: The PCGS Price Guide has this coin valued at $22,500 and the CPG Value is at $24,200. This underrated date ultra-gem has very pretty toning, but as gorgeous and scarce as this coin is, it’s available in this week’s auction with a reserve of only $18,750. That is $3,750 less than the PCGS Price Guide and $5,450 under the CPG Value! Why we love it: This Civil War-Era Gold Dollar type coin has nice, original surfaces with very intriguing coloring. On the obverse, this piece has a bright yellow colored center with a dark golden color around the rim which complement each other nicely. On the reverse, it is mostly all bright yellow with a touch of that deep gold on the devices. This coin has pretty luster and uniquely attractive eye appeal that makes it very high-end for the grade, which is why it received CAC approval. Value: The PCGS Price Guide has this coin valued at $775, which we believe depicts the true value of this coin. This perfect Gold Dollar type coin has very interesting color and CAC approval, and it’s available for purchase at a fair price of just $775 via Make Offer! Priced right at the PCGS Price Guide Value even with a CAC sticker! Why we love it: This historic example of a California territorial gold issue has very attractive surfaces and ideal coloring. It just has a small amount of light, even wear that only affects the highest points of the design. What makes this issue so historically important is that they were struck during the time and place of the California Gold Rush to help the San Francisco Mint keep up with the quickly rising population. Value: The PCGS Price Guide has this coin valued at $17,500. Our example of this historic territorial issue made during the time and place of the California Gold Rush has just very few traces of wear and pretty surfaces with perfect golden coloring. It is available in this week’s auction reserved very reasonably at just $13,750. That's $3,750 less than the PCGS Price Guide! Why we love it: A lustrous near-gem example of this very popular, scarce date Morgan Dollar from the Carson City Mint. The surfaces of this coin are bright white and covered with blazing luster making it look like a true gem. Not only is it high-end for its grade, but its MS64+ is the absolute ideal grade for this example because the price jumps dramatically in gem grades. Value: The PCGS Price Guide has this coin valued at $31,500 in its MS64+ grade. In MS65 it is valued at $75,000! 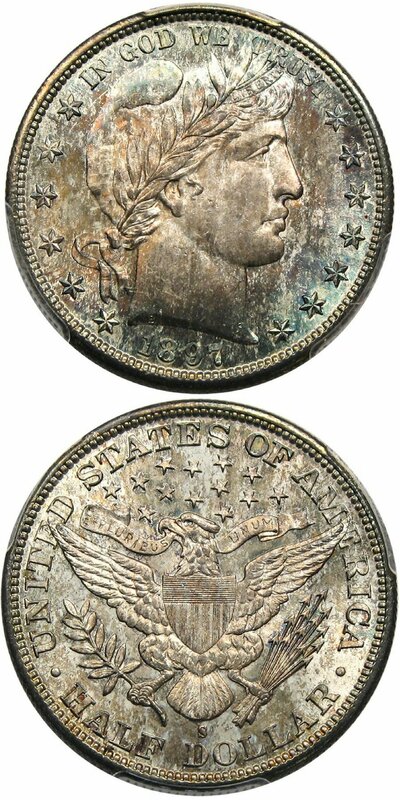 With that in mind, this scarce CC-Mint Morgan that is so close to gem condition is available for just $20,250 through Make Offer. That is over $11,000 under the PCGS Price Guide for its grade! This is a perfect opportunity to acquire this coin so close to gem grades without paying the additional $55,000! Why we love it: This toned gem is one of the most popular Classic Commemorative issues. It has a lower mintage of just 100,058 coins commemorating the 100th anniversary of Illinois joining the Union. This single year of issue has lovely original toning on both sides with bright luster shining through giving this coin fantastic eye appeal. Value: The PCGS Price Guide has this very popular, desirable Classic Commemorative valued at $650. This example has very pretty toned across the entire coin with plenty of visible luster and it is available for the reasonable price of just $600 via Make Offer! That is $50 under the PCGS Price Guide Value! Auction #999 Live! Browse & Bid Now!